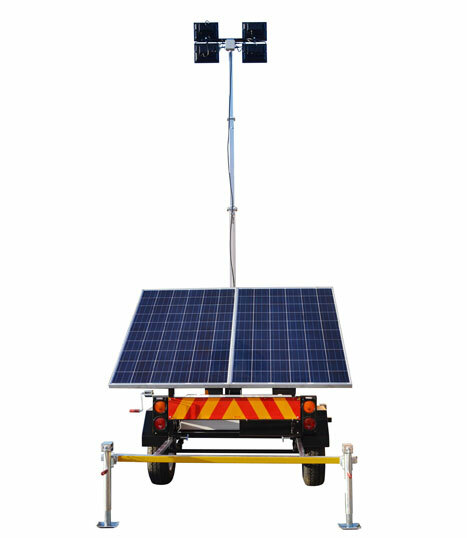 The Ian Dickie Solar Light Towers are robust, easy to operate, lightweight and portable. These towable units are particularly effective for noise sensitive applications as they provide silent, bright, energy efficient lighting using batteries charged via an adjustable solar panel. Ideal for special events, construction sites, security and many other applications where on-demand lighting is required. This system provides cost-effective bright white LED lighting without any of the disadvantages associated with traditional diesel lighting systems, such as high operating costs (diesel fuel, maintenance, labour) as well as carbon emissions, noise, fumes etc. For a list of applications for this versatile product, please download the product pdf. *34Amp battery charger includes change-over switch and isolator for optional 220V charging if required.